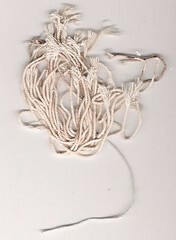 Managed to collect this bundle of Party Popper string on Xmas day. Need to make some smaller more delicate contraptions to keep it on now. Found in a special cracker sent by Roger and Jilly..how well they know me. Thank you..just what I wanted. 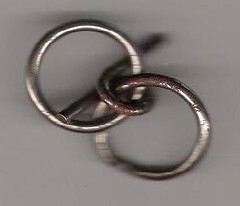 I love Xmas..you can always be sure of a metal puzzle in your cracker. 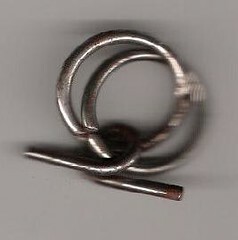 Again not metal..but fits in with my String project well. 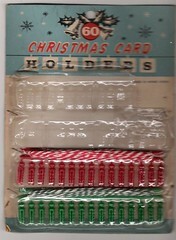 Little plastic pegs and a washing line to peg your Xmas cards onto. 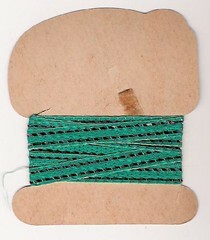 Not strictly metal,but the ribbon does have metal thread running through it. I found this today in a charity shop. 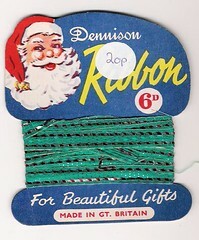 Dennison ribbon 6 old pence (D) for Beautiful gifts (so no wrapping it round any old tat). 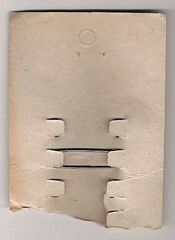 The back of the pack. About time I put something new on here. 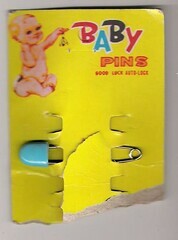 One baby pin on a card. 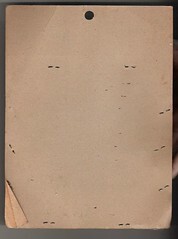 The back of the packet..which perhaps should be on obscure obverse!